Teeth in one day: myth or reality? Today is a very exciting time in implant dentistry. While many older dental practices in NYC still use old style dental procedures that take over a year, Tribeca Advanced Dentistry NYC can do it in a single appointment. Thanks to significant advancements in dental technology, we are now able to restore an entire arch of damaged or missing teeth with dental implants in just one day. Teeth in a day dental procedure used to take 6 months to a year and required wearing a removable denture for the duration of the process. However, now you can have damaged teeth removed, implants placed, and teeth attached to the implants, all in a single appointment. What is even more exciting is that you often need only 4 implants to replace a full set of teeth on the top or the bottom. Placing fewer implants is more cost efficient, less intrusive, and does not require painful and expensive bone grafting. This dental procedure is also recommended for patients who are uncomfortable wearing denture and would like to have teeth attached to dental implants. Teeth in a day procedure was developed by Nobel Biocare, a widely recognized leader in dental implants. Nobel Biocare invests a lot of resources into research and development of their products, making them superior to other implant companies on the market. This procedure enables clinicians to attach teeth to the implant at the same time with implant placement. 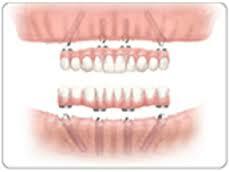 Teeth in a day or immediate implant loading procedure utilizing 4 implants is also known as “All-on-4”. All-on-4 protocol uses so-called “tilted implants.” The four implant posts are strategically placed at a 45-degree angle for two reasons: first, to increase their strength and stability; and second, to avoid damaging the sinus cavity in the upper jaw or the nerve canal in the lower jaw. Tilting the implants enables them to anchor to the better quality jawbone, improving their support. Also, All-on-4 uses longer dental implants, increasing the contact between the implant and bone and reducing the need for bone grafting (in which the jawbone is supplemented to provide a better base for the implants). The implant bridge, which replaces a full set of teeth, is attached to implants with a screw so that patient can function comfortably with them right after the procedure is completed. These teeth look and feel very similar to natural teeth. Surprisingly enough, the procedure is much less painful that the conventional implant process that requires patients to wear a removable denture after implant placement. This is due to the fact that the new teeth are attached to implants and do not irritate the gums the way the removable dentures do. Also, there is no need for bone grafting which can be very painful. This procedure is usually done under sedation so the patient experiences little discomfort. A team of prosthodontist Dr. Malkin and periodontist Dr. Moldovan of Tribeca Advanced Dentistry has been successfully performing this procedure for the past 7 years. Their work has been featured on CBS Doctor’s show, NBC news, and Klean Radio. They taught advanced courses and give lectures on the topic to other dentists and dental residents in New York City and Los Angeles. Please visit us at tribecaadvanceddentisty.com or call us at 212-355-4510.